EDUCATIONAL AND ENTERTAINING. They're safe for ages 6 years and up and works incredibly well with little hands. 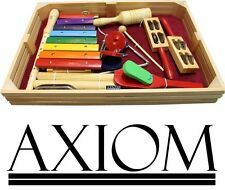 Let your child learn and enjoy as he creates the most brilliant sounds for you. You're in for a great find! 11pc Kids Drum set - Complete set. Color: Navy Blue, Size : XXL. All toys passed Federal Hazardous Substances Act Regulations. CHRISTMAS GIFT: Great Chistmas toy gift for preschool kids, children, toddler. Approved by US. newest ASTM F963-16 and FDA. Make sure this fits. Your kids will love it! This drum set is easy to set up and play. Let your kids develop their talents with this Fun Central Toy Drum set. Fun Introduction to Music Kids love to play. This is a good way for them to experience themselves with music. 1x Tambourine. It may not suitable for the claves and strikers or any other hard. 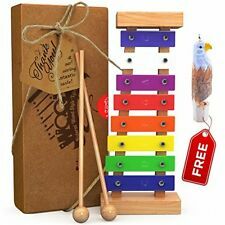 The kids will have fun to use it as a bell and make a very good sound by clap it with their little hands. to choose from. Piano Horn by Schylling [NEW]. Style:Piano Horn Blow the horn and press the keys to make beautiful music! Brought to you by Schylling Toys, the world leader in traditional toys and classic fun that lets children see the world in a new and more artistic way. AGreatLife’s toys are designed to combine learning with fun. From vibrantly colored Rainbow Kites to classic wooden toys like the Xylophone and the Wooden Abacus, to the mind-boggling Cube, Cuby, and Carbon Fiber Cube, aGreatLife wants to provide children with safe, ingenious, and high-quality toys that will stimulate their imagination and senses, help them interact with others, learn more about the world around them, and develop essential life skills. Piano Horn by Schylling. Style:Piano Horn Blow the horn and press the keys to make beautiful music! Brought to you by Schylling Toys, the world leader in traditional toys and classic fun that lets children see the world in a new and more artistic way. 1 pcs Whistle ramdom type. 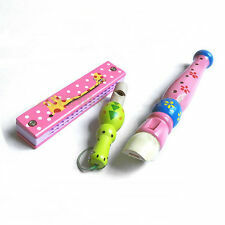 1 pcs Flute ramdom type. Pacakge: bag. Weight: 0.3kg / per set. 1 pcs Harmonca ramdom type. With a beautiful, red, gloss finish the drum set will surely highlight your child's room and entertain for hours. 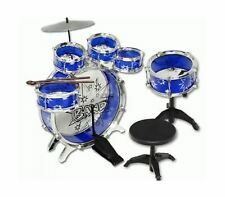 Hone in your child's musical talent early with this high quality junior drum set! Another fun Desktop Drum Set product brought to you by Fun Central. Style:Piano Horn Blow the horn and press the keys to make beautiful music! Brought to you by Schylling Toys, the world leader in traditional toys and classic fun that lets children see the world in a new and more artistic way.